That's something that happens 100 per cent of the time with all shaders except procedurals. There are always tradeoffs, and with shaders this is one of them. Shaders follow the model's MAT zones 100 per cent. If the maker has used a texture map to apply seamless textures, obviously a shader isn't going to do that. It's up to each person to decide whether or not the benefits of using shaders in this way out weigh any negatives. There is absolutely nothing I can do about this. Sorry. You made that texture? Brilliant job, It's one of my favorites, Thank you. I hope you'll see it used now. Yes, indeed I used Filter Forge and anything else I could get my hands on. ..cool. On the wishlist until Payday Tuesday.. Thanks Ghostpanther. I priced it so you wouldn't need the voucher so badly. Tomorrow I'm launching the Second Annual Kit Bashing Contest with lots of great prizes and a new Prop Pimping section so people will get a chance to show what they can do. Looks good, but will it work in DS4? Sounds awesome. Should be the very thing to get me out of the rendering slump I've been in recently. Straight in the cart and checked out. I can see many old props being dusted down, spruced up and used. It needs 4.5. At the time I saved the presets, I was unaware that 4.5 could save dsa files. Sorry. Aghh! Will you people ever stop making new things for me to buy? Seriously, though, this is wonderful. I've been using other shaders to do the same thing, but this is an incredible selection of exterior textures! In the cart it goes and ka-ching! Are you talking about Sci Fi surfaces? I'm not sure. I don't render Sci Fi so I'm not sure I'd do it justice. Not so much sci-fi as modern building materials, especially things like concrete, acoustical tiles, metal sidings and especially metal gratings and bars. I've got a pile of poser models that I don't use much because I either have to re-tweak the materials for DS, or because they're way TOO weathered, grungified or sci-fi-esque, so a followup set with a product name like "Urban Renewal" would be a huge boon. Everything you've mentioned here except the acoustic tiles is in Pimp My Prop. Just like to say that I love this set and will have plenty of fun with it. I was just playing around with it and came up with the image below. 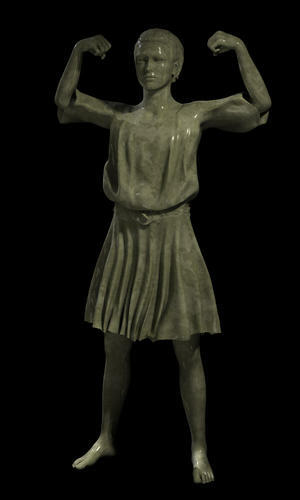 It is the Genesis base figure with Ph Classic hair and the Roman tunic and one of the marble textures applied. I really hope there are some expansion packs for this set. ...oooh, I didn't think abut that. Only four days to go. Hope it stays on sale until then. If it sells well, I can certainly do expansions. There are lots of stone and new textures I didn't include and I can generate all kinds of different marble. Kyoto Kid, you have plenty of time to pick this up. you probably mentioned on an earlier thread but is this DS only or will it be for poser too. How does it look on dreamhome? It's DS 4.5 only and works fine on Dream Home. Thanks Marieah. As I said, I was just playing with it and that was just a test render. I know the set was geared towards buildings, but when I saw the marble textures it made me think and I wanted to see how it would work on people. As I was pleased with the result I thought I would post it. I hope it does sell well as I am already looking forward to the expansion packs. Ditto that! I was out of town but couldn't wait to play with these, so I loaded up a new copy of DS4.5 and tried out a few on the base genesis figure. Pretty darn spiffy. ...the straw man...that's pretty cool. Okay... I've run into something that I figure there IS a solution for, but I'm still a novice with shaders. 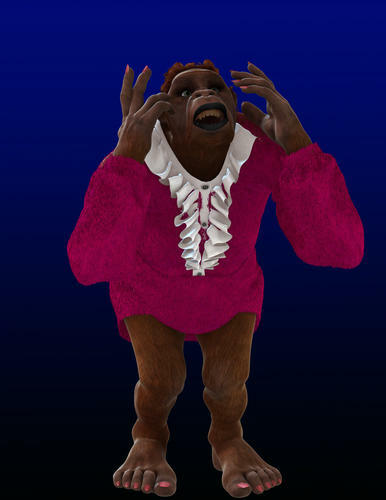 I'm using the astroturf shader to turn the office lady outfit into something a bit flashier for my OOL (Orangutan Office Lady,) but the shader keeps punching through the fabric layers where the ruffle passes over the coat. Obviously I can fix it in photoshop by rendering two versions, but it seems like there ought to be a way to do it in one pass. Any suggestions as to what I'm missing?